Hello everyone at All Things Open! We’re excited to be at #ATO2016 this year in partnership with the organizers of All Things Open to produce a series of podcasts around this great conference and community. Our plan is to talk to those leading the way for open source and open communities to share their story. If you’re reading this, we want to talk to you, so come by booth #58 and see us. BTW, we have tons of stickers to give away. Come by and get yours. We’re at booth #58. 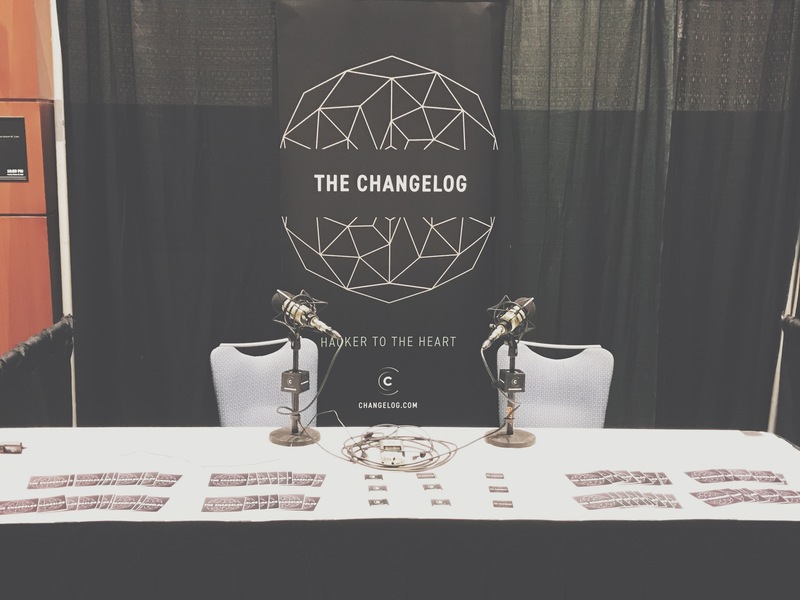 We’ll be recording interviews and live streaming all day for both days of the conference at changelog.com/live. You can tune in on desktop or mobile. It should auto-play, but if you don’t hear anything, refresh. If you continue to hear silence we may be off-air for the moment. Look for updates on our live stream at @Changelog on Twitter. Who do we want to speak with? We want to speak with everyone — however, we are here on behalf of All Things Open to talk with as many speakers as possible for the podcast series we’re producing for them. But everyone has a story to tell, so regardless if you’re a speaker or attendee, we want to hear from you and help tell your story. If you’re a speaker — you likely got an email from Todd Lewis personally inviting you to come by and speak with me. If you’d like you can schedule a time to come by that best fits your schedule. Speakers only please — head to calendly.com/adamstacoviak/all-things-open and book a time that works best for you. Pick from either Wednesday or Thursday. If for some reason a time that works best for you isn’t open, holler @Changelog on Twitter, or snd an email to editors@changelog.com. If you’re an attendee — we’d like to speak with you as well. Come by anytime to say hi and tell us your story. We’re here “in the trenches” with you to help tell the stories of those leading the way for open source and open communities. We 💚 open source and all things open, so naturally, we’re in good company. Once we’re done, we’ll release a series of individual episodes and round up episodes on our upcoming podcast Spotlight. If you don’t want to miss out, subscribe to Changelog Weekly for our latest updates. When we head out into the community, we want to help tell the story of those communities. Spotlight is our new podcast to help us do this — it focuses on telling developer-centric stories that need to be heard. Of course, Spotlight will have features and segments shared on all of our shows – The Changelog, Go Time, Request For Commits, Backstage, Changelog Weekly — as well as our syndication partners like O’Reilly Media, dev.to, The Linux Foundation, and more.